We work with corporations, government, organizations, NGO's, educational institutions, as well as small businesses and individuals. 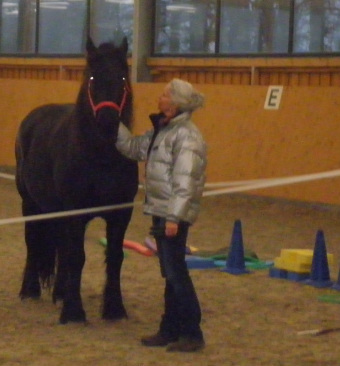 Horse Assisted Education has been popular for nearly two decades in Europe. It has expanded over the past decade at a global level, working with companies, organizations and industries of all levels. Testimonial from Jean Jones on her experiences of "The Art of Leadership"
Learning is a journey of exploring new opportunities. Working with horses was severely beyond my comfort zone. 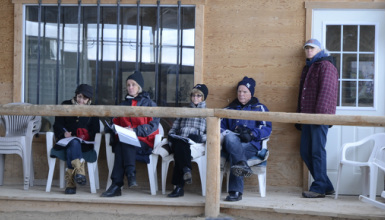 Transferable skills with purposeful engagement are the rewards of HorseDream Leadership training. Group discussions and classroom learning supplement each of the exercises. The incremental skill development achieved, by working with horses, effectively facilitates team development. The numerous obstacle courses provide extraordinary opportunities for breakthrough leadership performance. I became more aware of my body language, mannerisms, and tone of voice. As well, I learned to observe and respond appropriately to the horse’s body language. Ozzy provided direct feedback through his behaviours. Noticing his cues prompted me to modify my leadership style. By being consistently attentive, I chose what to do and how to be, which was both a necessity and an invitation for Ozzy, Tridun, and me to be a team. Small adjustments generated more effective communication, engagement, and leadership skills. Being responsive to body language, both the horses’ and mine, prompted solution building, as the situations changed. How I was perceived and accepted, by the horses, reflected my leadership abilities, which became more efficient as the difficulty of the challenges increased. I made effective choices by developing trust, relaxing, being flexibly responsive, and allowing transformation to evolve. Learning how to be a leader with horses is an unforgettable experience. Horses are the ultimate team players. Ozzy, Tridun, and Chick taught me how to expand my repertoire for interacting effectively. These transferable leadership abilities will continue to enhance my personal and professional lives. After the final exercise, our group discussed how we managed our fears; gained the horses’ trust; embraced new challenges; became empowered; and efficiently completed the various obstacle courses. We discovered empowering options for shifting the horizon of what is possible. This extremely collaborative process exponentially enriched and transformed our leadership competencies. Jean Jones is a solution-focused business coach and workplace mobbing specialist. Her MA specialization is organizational change management. Jean is on the Womens' Resources Board of Directors and the CECC Community Advisory Board of Directors. I have never shied away from new experiences. I am drawn to find and learn from new ways and to meet and spend time with like-minded individuals. 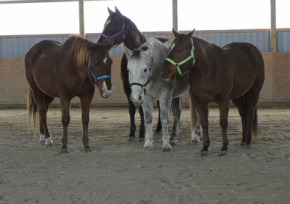 The day with the horses at Wilson H2 Ranch was wonderful in so many ways. First of all, it fed perfectly into my love for horses – an animal I have always admired from a distance. The hands-on exercises with the horses were so rewarding and it has further reinforced my understanding of the power of the relationship between man and horse. My personal reward came throughout the day when I found each horse I handled became more trusting and receptive to my direction. At the beginning, they were not sure and did not understand my ‘body language’ and perhaps sensed my hesitance as I found my way with them. With each encounter, the horse showed more responsiveness to my direction, making me more reassured that I could lead and he would follow willingly. I came to appreciate the importance of living in the moment, with no time or reason to worry about yesterday or be concerned about tomorrow. The peaceful and serene atmosphere of the arena was refreshing. I so appreciated Susan’s style which truly allowed me to be me with no expectations – just encouraged me to respond to the moment and show leadership my way.